Strong-Rod fully threaded rod (all-thread rod) is the tension transfer element that can be used within both the Anchor Tiedown System for shearwall overturning restraint (ATS) and the wind uplift restraint (URS) system. 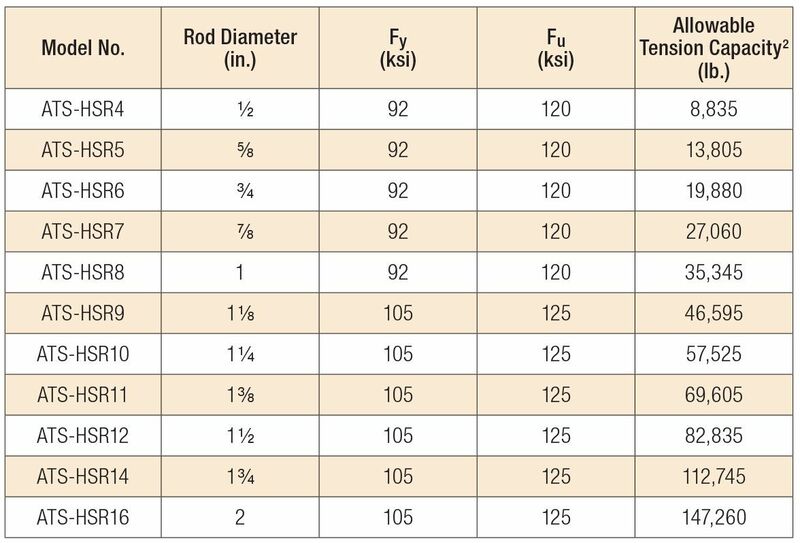 Fully threaded rod is available in standard-strength, high-strength and higher-strength rod material in diameters up to 2". 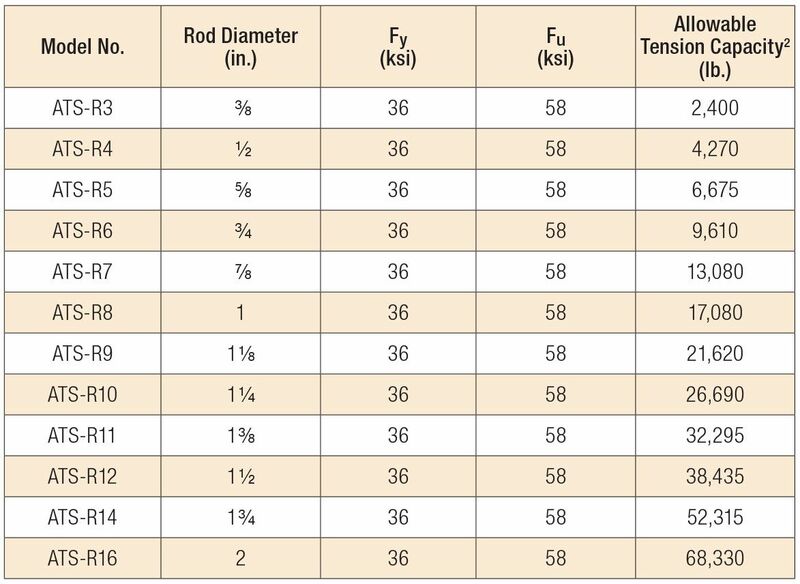 Allowable tension capacities are based on AISC 360-10. No further increase in allowable load is permitted. Available in 1' increment up to 12'. Special sizes available upon request. ATR1/2 No evaluation report listing. ATR3/4 No evaluation report listing. ATR3/8 No evaluation report listing. ATR5/8 No evaluation report listing. ATS-HSR10 No evaluation report listing. ATS-HSR11 No evaluation report listing. ATS-HSR12 No evaluation report listing. ATS-HSR14 No evaluation report listing. ATS-HSR16 No evaluation report listing. ATS-HSR4 No evaluation report listing. ATS-HSR5 No evaluation report listing. ATS-HSR6 No evaluation report listing. ATS-HSR7 No evaluation report listing. ATS-HSR8 No evaluation report listing. ATS-HSR9 No evaluation report listing. ATS-R10 No evaluation report listing. ATS-R11 No evaluation report listing. ATS-R12 No evaluation report listing. ATS-R14 No evaluation report listing. ATS-R16 No evaluation report listing. ATS-R4 No evaluation report listing. ATS-R5 No evaluation report listing. ATS-R6 No evaluation report listing. ATS-R7 No evaluation report listing. ATS-R8 No evaluation report listing. ATS-R9 No evaluation report listing.